The Lo and Behold Group, the folks behind chic establishments such as Loof, The White Rabbit, OverEasy, A Curious Teepee and Tanjong Beach Club, has introduced their most casual F&B concept to date – the Extra Virgin Pizza, a contemporary pizzeria serving artisanal, hand-crafted pizza, located in the heart of CBD, at the ground floor of Tower One at Asia Square. And if you are wondering how serious they are with their craft, Extra Virgin’s pizzas are hand-made and baked to order, and uses Italian double-zero flour (In Italy, flour is classified either as 1, 0, or 00, and refers to how finely ground the flour is and 00 being the most highly refined), California organic Saporito tomatoes and imported cheeses and toppings. 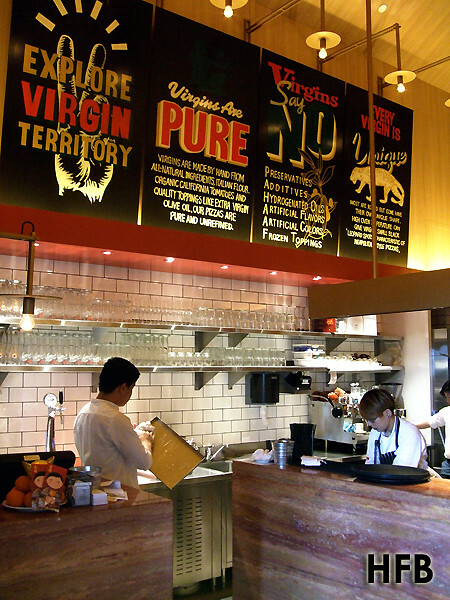 And sitting behind the pizza line sits the star attraction of the space – two large Woodstone® pizza ovens clad in a mosaic of the Extra Virgin logo – the exact same ovens that are used by Chef Mario Batali at Pizzeria Mozza, Marina Bay Sands!! 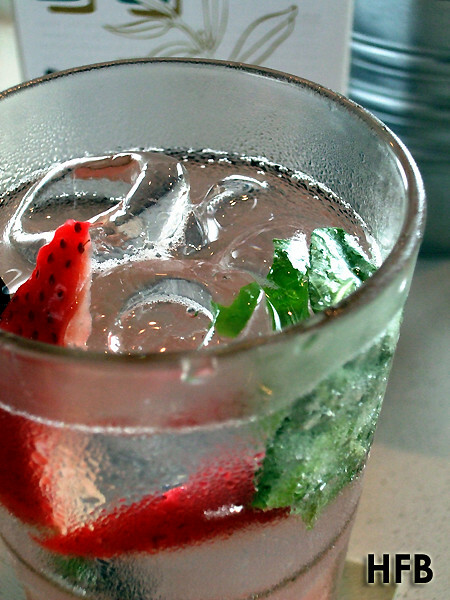 Lunch got going with the house-made soda of Strawberry Basil ($6.00). This was really light and refreshing, and set the right mood for what’s coming ahead. 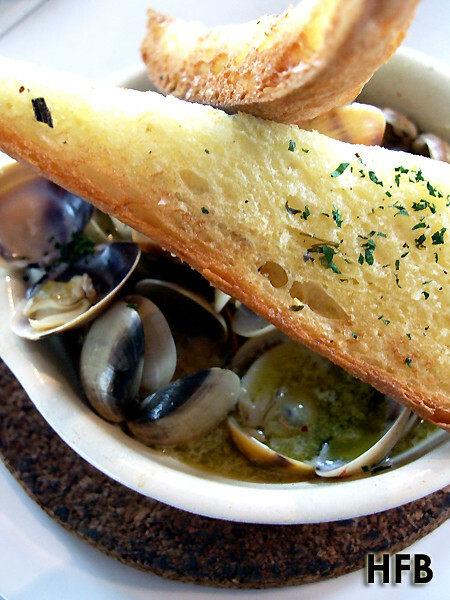 For starters, the Oven-fired Clams ($18.00) were lightly flavoured with white wine, garlic and butter, and HFB was charmed by the satisfying wine aroma within. It helped that the cooking method retains heat, making this starter an enjoyable dish. 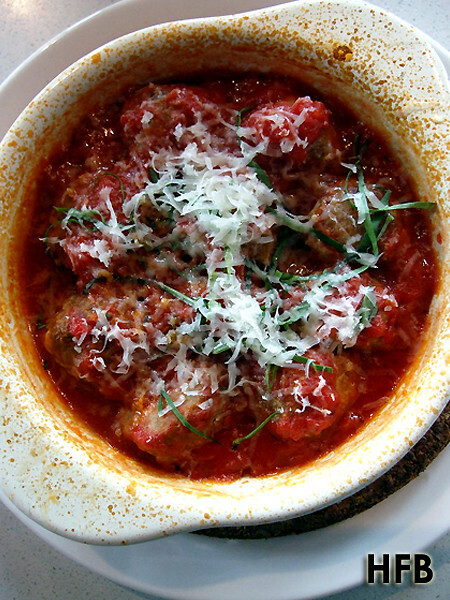 HFB definitely enjoyed the Veal & Ricotta Meatballs ($15.00). Made fresh in-house, and topped with Tomato Sauce, Provolone Cheese and Basil, the meatballs were really hearty and almost divine, well, if not for the sauce that was a tad sour for HFB. 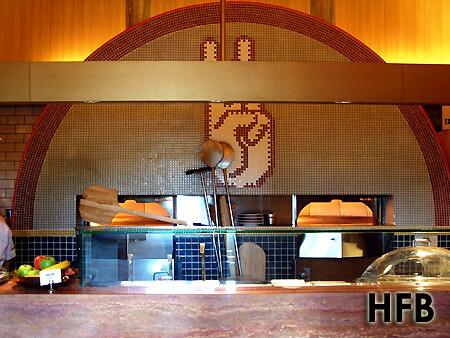 But even then, it was really flavourful and HFB really took pleasure in it. 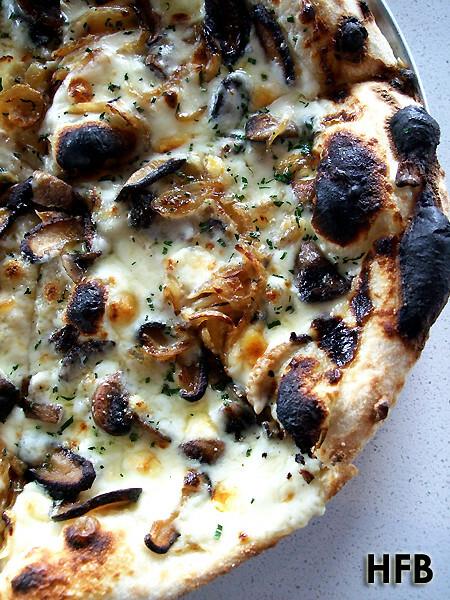 If you are a fan of mushrooms, one would definitely wish to indulge in Extra Virgin’s Mushroom Bianco ($22.00). Using béchamel as a base sauce and topped with Mozzarella and Fontina Cheese, along with Roasted Mushrooms and Caramelised Onions, HFB also caught a whiff of Truffle Oil!!! The mushrooms were cooked juicy and the caramelised onions were distinct winner! How awesome was that?!?! 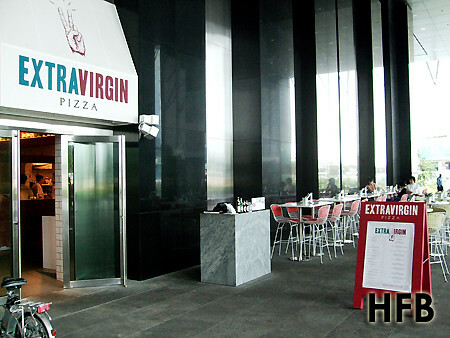 And if you find a béchamel-based pizza not unique enough, why not give Extra Virgin’s Pistachio ($24.00) pizza a try? Using Pistachio Pesto as a base and topped generously with Mozzarella and Parmigiano Reggiano Cheese with heaps of Baby Arugula and Lemon Vinaigrette, this is truly only one of its kinds that HFB had came across so far. Each slice came with nutty goodness of the pistachio nuts that also provided that added texture and crunch. 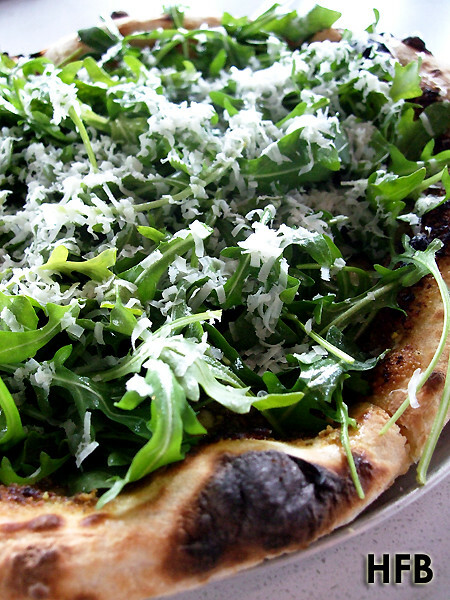 What’s more the lemon vinaigrette paired really well with the subtle bitterness of the arugula and brought the whole pizza neatly together. Brilliant! 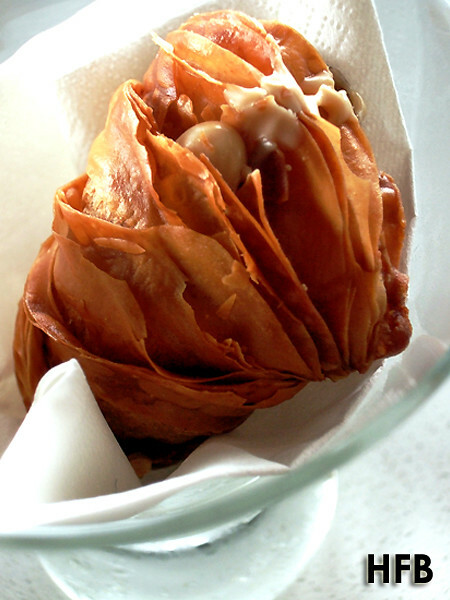 And to finish it off, you definitely need to order the Lobster Tails with Hazelnut Filling ($3.00 each, min. 2 orders) as the dessert. A crisp and flaky pastry, the hazelnut filling was tasty and the outer layer was undeniably CRUSTY. Simply Remarkable! Disclaimer: No ratings would be given, as this is an invited media tasting. HFB would also like to take this opportunity to thank The Lo and Behold Group for their hospitality. MUST BRING ME HERE TO EAT!!!!! $24 a pizza seems somewhat extravagant, especially if the flour they're using is double zero flour, the lowest protein version. While I cannot ascertain that it is the highest, the fact is the protein content of "00" flour can range quite a bit depending on what kind of wheat it's ground from. Most "00" flour is ground from durum wheat and has a mid-range protein content of about 11-12%, similar to all-purpose white flour. But IMHO, I doubt most people consume pizza for it's protein content, but more for taste and texture, and that's where "00" flour stands out against the other flour. As for pricing strategy - well I am not in position to comment. Cheers! Do you think your review will be different if you had to pay out of your own pocket, ie, when you feel the pinch? Anyway, to answer your question - no I doubt it will be any different. I do not usually hold back my words and thoughts when I do my reviews. I sincerely believe in content integrity.